By writing “Jesus of Nazareth”, the Pope joins the long line of scriptural exegetes found in the history of Christianity extending back nearly 2000 years. In this book there is much echoing of a number of the early Church fathers: two in particular that seemed to stand out were Irenaeus and Origen. Like Irenaeus, who wrote “Against All Heresies”, the Pope too writes against all heresies. He does this because at the heart of all heresies lies the denial of the fundamental truth that Jesus is both God and Man, and in his new book, the Pope seeks to find not only the Jesus of history, Jesus of Nazareth but also the Jesus of the Trinity, the God-man, Jesus the Christ. However, the Pope is not directly writing against a select group of people, he is presenting to the reader Jesus of Nazareth in an attempt to restore Christ’s true identity as Jesus the God-man as found in scripture. The approach he takes in presenting Christ is one rooted in exegesis where the Pope uses a holistic approach to scripture letting the text speak for itself. He does not look at each book of the bible as a separate stand-alone text. Instead, he views each book as a part of a larger whole where the fullness of the Gospel message can only be understood in this light. Because of his holistic approach to scripture, Benedict overlays the gospels one on top of the other. He does not stick to one Gospel but includes them all in order to find the true Jesus as present in the text. This approach is contrary to much of current biblical scholarship, but at no time in the book does Benedict do away with current biblical scholarship. In fact, he often uses it but always points out its limitations to the reader. For the danger of the historical-critical method of biblical understanding, as found in current scholarship as taught in most state universities, is that the interpreter is routinely tempted to do away with the divinity of Jesus for the sake of His humanity and in doing so ends with an inauthentic Jesus. The Pope presents Jesus to the reader as the New Moses, the Kingdom of God/Heaven, and the new Torah. He does this by making connections for the reader. He points out how Jesus fulfills the Old Testament and its prophecies. He points out how the Jews would have responded to Jesus message, and why they responded in the way they did. He points out where and how the Old Testament and the New Testament connect: that point being the person of Jesus the Christ. In other words, the Pope uses the Old Testament to bring light to the New Testament, and he uses the New Testament in order to understand and make sense of the Old Testament. Being 2000 years removed from the original message, the original meaning of scripture has at times become hidden or lost due to certain social exegetical practices, according to Benedict. In response to the lost meaning of scripture, the Pope breaks open words, phrases, and concepts used in scripture in order to get at the heart and original meaning of the texts that is more often than not richer in meaning than most readers are familiar with today. Do you know how many different ways “Kingdom of God” can be and has been interpreted? Do you know what exactly is meant by “daily bread” as expressed in the Our Father? In each chapter, the Pope provides the reader with a brief historical examination as to the development of theology through the ages. He points out where certain ideas originated, how they became popular, and how the original meaning of scripture became lost or hidden along the way. If a person would take the time, one could use this book to not only see Christ more deeply, but also to see how Christ became blurred and difficult to find through the years. In other words, you can use the book to follow the development of certain heresies that have origins in improper interpretation of scripture. The best thing about this new Pope is that he is easy to read. Although the text itself is written by a smart man, you do not have to be on the same intellectual level as the Pope in order to understand it. It is clear from his ease of language that he intended this book to be read by more than just theologians, university students, and other “smart” people. Also, the book is complete with a glossary for some of the more difficult and unfamiliar words a reader, who is unfamiliar with certain theological jargon, might encounter. That is, the Pope wrote this book and made its content, themes, and ideas easily accessible to most people. 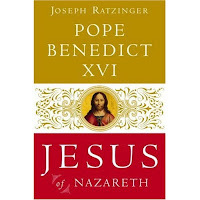 It is true that although the book is complete, the work itself is incomplete, as “Jesus of Nazareth” only covers the life of Jesus from His baptism to the transfiguration. In the foreword, the Benedict expressed his concerns of failing health and the desire he had on his heart to publish at least part of his “personal search ‘for the face of the Lord’” (pg xxiii). So look forward to a second volume to this work, God willing. What disappointed me about the text is that I did not learn much that I did not already know, but such is the case of a Theology student. I imagine that most people who are familiar with theology, particularly the early church Fathers, will find it to be the case also. I also felt that the Pope failed to make certain connections that would further develop and more clearly present a couple of his theological concepts, one being Christ as the New Moses. At times it also seemed that Benedict wanted to say more but did not because he wanted to keep the book readable and accessible to a broad audience. What I liked most about the book is seeing the Pope’s own personal search for Christ unfold in the text. I also liked the how Benedict opened up certain words from the original Greek or Hebrew to get at the heart of the meaning of the word. I also enjoyed the short historical analysis that traced the origin of certain theological concepts to their modern ideas. Also, interlaced in the text are the Pope’s own brief but seemingly accurate social commentary. “In the antithesis of the Sermon on the Mount, Jesus stands before us neither as a rebel nor as a liberal, but as the prophetic interpreter of the Torah. He does not abolish it, but he fulfills it, and he does so precisely by assigning reason is sphere of responsibility for acting within history. Consequently, Christianity constantly has to reshape and reformulate social structures and ‘Christian social teaching.’ There will always be new developments to correct what has gone before. In the inner structure of the Torah, in its further development under the critique of the Prophets, and in Jesus’ message, which takes up both elements. Christianity finds the wide scope for necessary historical evaluation as well as the solid ground that guarantees the dignity of man by rooting it in the dignity of God” (pg 126-27). --I could easily see this book being used in an “Intro to Jesus” or an “Intro to Biblical Exegesis” class on the undergraduate level in a university setting. --Due to its readability, this book would also make a great text for a parish-reading circle. --For anyone interested in biblical exegesis, but has never encountered it before, this book is a great starting point. --Although it is more scholarly, the book itself is still a good source for reflection and meditation upon the authentic Jesus and His message. --Anyone interested in learning more about Jesus.